On Sunday, the San Francisco Chronicle ran an amazing narrative from a young San Francisco dentist, Leonie von Zesch, who wrote for an unpublished autobiography about her experiences during and after the 1906 earthquake and whose writings ended up in the attic of her niece, who stored them for decades without knowing about the remarkable voice hidden inside until recently. It’s fascinating and fun; here’s an example: “When finally the tremors stopped, we got up and dressed. I put my right shoe on my left foot and vice versa for the only time in my life, and didn't know it until later. Then we hurried up to the roof to look down over the city.” You can read Sunday's first half here, and Monday's second half here. In my talks, I recommend using “maze” picture hooks to prevent framed pictures from crashing down in earthquakes, since they can easily jump out of the typical picture hooks. Surprisingly, the story from 1906 that I just described above mentions that the pictures swung out from the wall but didn’t fall; that woman was lucky! Pictures frequently jump out of their hooks even in smaller earthquakes. However, I admittedly oversimplify this in my talks, because we frequently have pictures that are in frames with saw-teeth or other kinds of built-in hooks, with no picture wire. So what then? Here are a few ideas of how to best use these maze hooks (I have no financial interest in this). First of all, if your frame does have picture wire, there are a couple of little annoying aspects of the maze picture hooks that are easily avoided. First, they are taller than normal picture hooks, so sometimes when the picture hangs from them, the very top of the white plastic hook is visible above the top of the frame. If this happens, you just need to shorten the wire, and usually you can easily find a length that still works and doesn’t show the plastic. 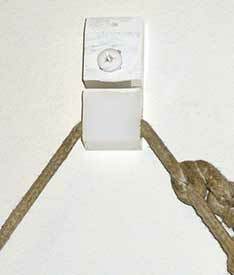 Second, these maze hooks can hold the wire a little farther out from the wall than the typical hook does, so the picture can have more of a tendency to tilt downward since the top is farther from the wall than the bottom. You may not care, but it this bothers you, a neat trick is to take two small pea-sized chunks of quake putty (the kind you use to stick small objects down to surfaces) and put one between each bottom corner and the wall. This not only holds the bottom out from the wall and straightens the picture a bit, but it also has the added bonus of preventing the picture from tilting side to side. You center it once, and it can even be a little bit off center, but the putty will hold the picture straight. Now, what do you do if the frame doesn’t have picture wire? Add some! With most wooden frames, it’s simply a matter of taking two screw-eyes and screwing them into the wood. Usually, no drilling is required. You can just take a sharp metal object and punch a small starter hole, then put the screw eye’s sharp tip into that tiny hole and twist it with pliers to screw it in until the metal ring part is just about flush with the wood. You don’t have to push, just twist and it will thread itself. I typically break about 1 in 10 of the screw eyes in the process, and have to start again, so have more than you need. Usually about 1/4 to 1/3 from the top is a good location. 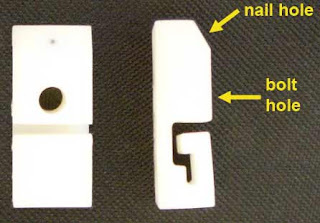 If they are too high, then it will be harder to prevent the top of the plastic maze hook from showing; and if they are too low, the picture will hang at a strange angle and not be very stable. What if the frame is not wood? 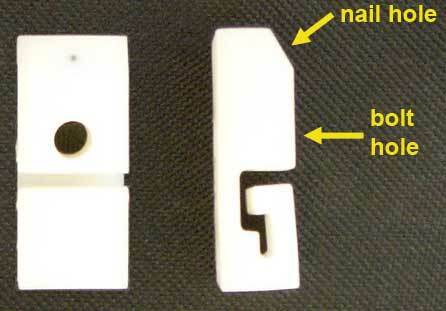 Frequently there are clips that are holding the frame together, and if they are strong enough, the picture wire can be attached directly to two of these clips. 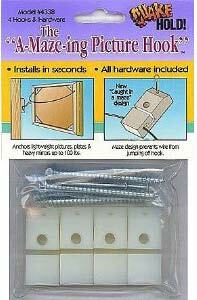 There are some frames to which you simply can’t attach picture wire without glue. I avoid these when I buy them in the first place. For some smaller picture frames, like some very light-weight frames for 5x7 photos, I admit that I just hang them on normal hooks from whatever hole or hook is built into those frames, but only if they are light. And don’t forget, you can always opt to post such small things directly on the wall without a frame. That quake putty is really good for this also, a tiny bead behind each corner; or the 3M Command strips that have the pull tab for release; some of these are meant for posters. Just make sure you do that in a way that allows you to have access to the pull tab in case you ever want to remove it! By the way, one more thing about these hooks: in addition to the little diagonal nail hole for standard mounting, they also have a larger horizontal hole for screwing or bolting it into a wall stud. This allows the hooks to be used for heavy objects. 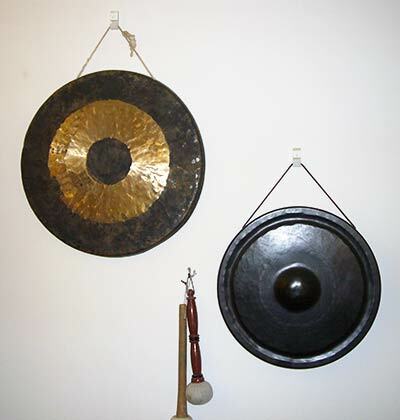 I have a couple of gongs (about 2 feet diameter) hanging on the wall by cords (shown in the picture on the left), and the cords used to be in regular hooks but they currently are hanging from the maze hooks. They are heavy enough that I wasn’t convinced that they would remain attached via that little nail, so I have screwed them into a metal wall stud using the large hole and fastened it with a toggle bolt (as the other photo shows, I painted over the bolt to make it match the plastic hook and the wall). In a quake, those gongs aren’t going anywhere, unless the string breaks. Remember, even with the maze hooks, please don’t hang heavy objects over the head of your bed, because if you have nailed it into drywall, that chunk of drywall could potentially fall apart if a quake is large enough; and even if you bolted it, nothing is foolproof!